Xigmatek presents the Asgard Pro, a new mid-tower with additional space, better airflow and USB 3.0 support. 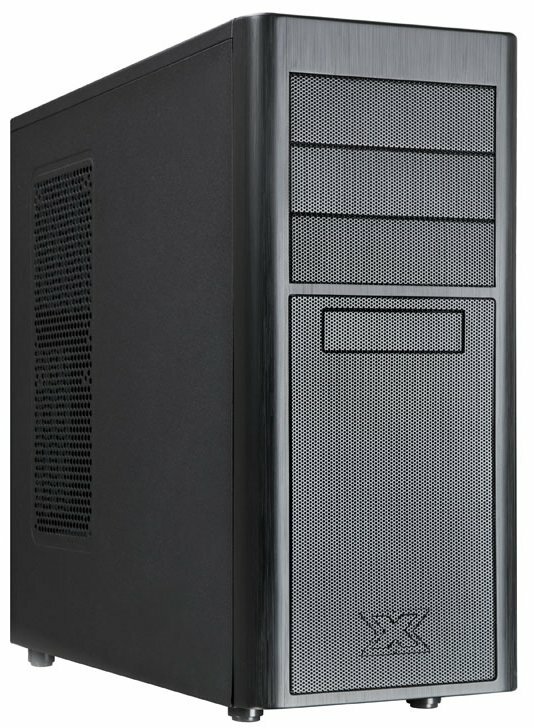 The vastly successful Asgard chassis from Xigmatek shaped the industry when it was first released, offering an excellent price/performance ratio. The new Asgard Pro aims to follow in these footsteps while offering all the modern features needed to build a potent system, including a more flexible interior, upgraded air flow and proper inclusion of USB 3.0. Xigmatek offers an small but certainly unique set of cases, which includes everything from the spacious but compact HTPC-Cube Gigas, the affordable Asgard series, the potent Midgard I and II to the Ultra-Big-Tower the Elysium. The Asgard Pro aims to take the entry level series to a new level, with the same genes that made the previous three Asgard cases such a success. With the Asgard Pro, Xigmatek aims to fill the gap between the original Asgard and the Midgard variants. This is also underlined by the fact, that the Xigmatek Asgard Pro weighs in right between these two case series with 20.1 x 44.8 x 48.2 cm dimensions. This allows the chassis to hold larger, and more powerful components, including modern graphic cards and CPU coolers. Even so, Xigmatek has ensured that the Asgard Pro manages to fit right in with a timeless design, with straight lines and the use of sturdy metal mesh in the front and along the top of the enclosure. The efficient mix of these materials results in the best possible air flow, while the plastic parts mimic the surface of brushed Aluminum. Instead of the orange elements, which were found in the previous Asgard cases, Xigmatek has chosen to go with the times and offer an understated all black interior instead. This includes the updated screw-less locking mechanisms, which have been applied to every drive bay within the chassis. There are seven slots for internal 3.5 inch drives, a single 2.5 inch bay and the trio of external 5.25 inch external variant, for a total of 10 bays for maximum expandability in such compact dimensions. An expanded and modernized I/O panel is also one of the key features of the Xigmatek Asgard Pro. In addition to the two USB 2.0 ports, Xigmatek has included a single USB 3.0 connector with an internal 20-pin connector. Thanks to the space behind the mainboard and the multiple openings of the motherboard tray, the Asgard Pro also allows for easy cable management. An extra large opening in the plate enables the easy access to the CPU cooler backplates without having to disassembling the entire system. Offering 31.5 cm of space for expansion cards, the Xigmatek Asgard Pro can hold most high-end hardware, while two pre-installed 120 mm fans ensure the proper air flow from the front to the back of the chassis. For maximum flexibility, one may install an 140 mm variant in the front instead, while the top and side panel offer space for two additional 140 mm cooling units each, which brings the total number of installable fans to seven with the inclusion of the space in the floor of the Asgard Pro. With this potent mix of functional features, the Xigmatek Asgard Pro offers everything one would expect to see in a mainstream chassis at an unbeatable price point - just as one has come to expect from the incredible Xigmatek Asgard series. The Xigmatek Asgard Pro Mini-Tower case priced at £34.99 will be available at the end of March, available exclusively from www.overclockers.co.uk.